HOBOKEN, NJ PHOTO STUDIO RENTAL. Hoboken, NJ Spacious Photo Studio Available for Rent by the Hour, Half-Day and Full-Day. Multi-Day and Recurring Monthly Membership Packages Available. Are you a photographer in Northern NJ looking for that “perfect” photo studio rental? Well look no further! Why drive into NYC and spend more than you’re making when you can have a 1300 Sq ft. Loft, flooded with natural light @ $27 an hour! 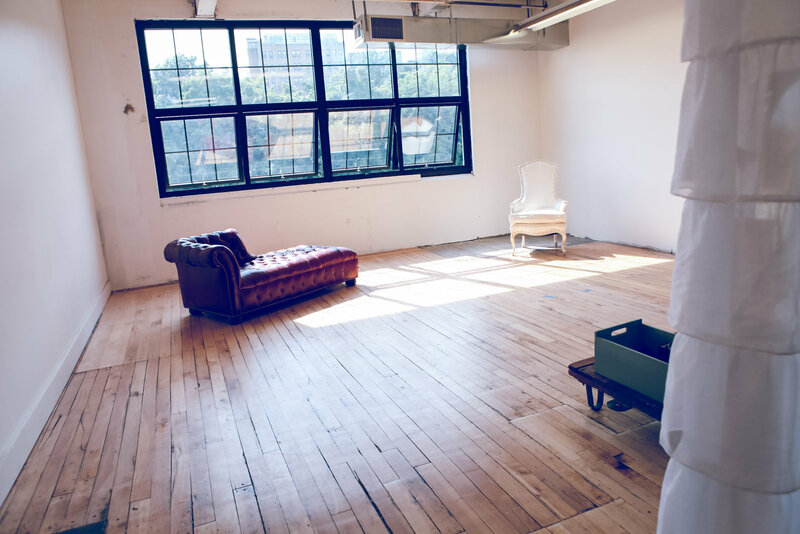 This Space is 1300 Square Feet, boasts high loft ceilings, huge industrial windows, and tons of natural light. The rental itself INCLUDES door to door amenities such as a free parking lot, industrial size elevator, ramps, double doors for large equipment (a true luxury in Hoboken) tons of backdrops, external monitors and carts, TONS of prop furniture. The space is divided into three areas, however, everything can be easily moved to best suit your needs. The first third is what we use for a model holding area. 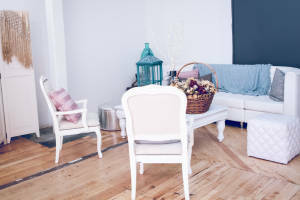 There is a white leather modern couch, shabby coffee table, two white queens chairs, and two ottomans providing ample space for larger groups. 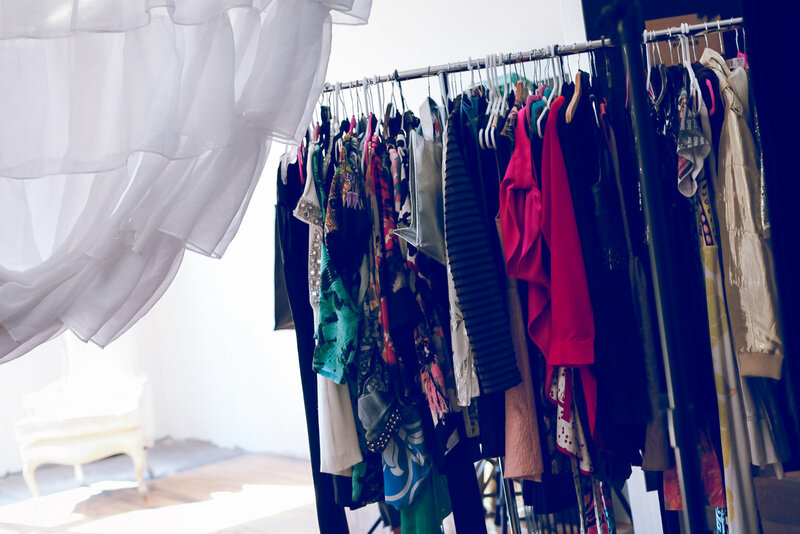 A large Wardrobe facing this area serves as a divider between those waiting and the shooting area. Additionally, on a dropped rod 125″ sheer white panels allow for more space division and privacy in the shooting area. We have brackets for any size backdrop. We also have an expandable freestanding backdrop ideal for fabric backdrops. Steel Cart with three tiers, Ideal for shooters that need a laptop nearby and would like tethered capture. Couch and coffee table for lounging or props. 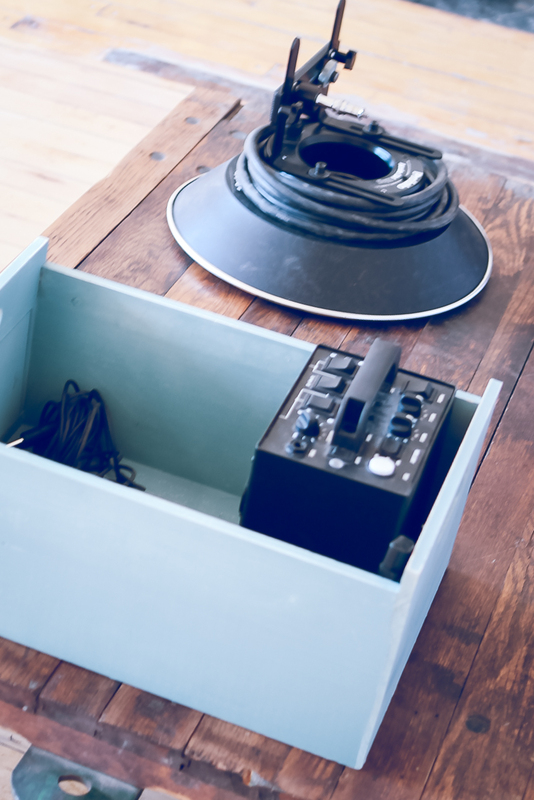 Large Cubby Area to hold Model Wardrobe, Lighting Equipment, Etc. 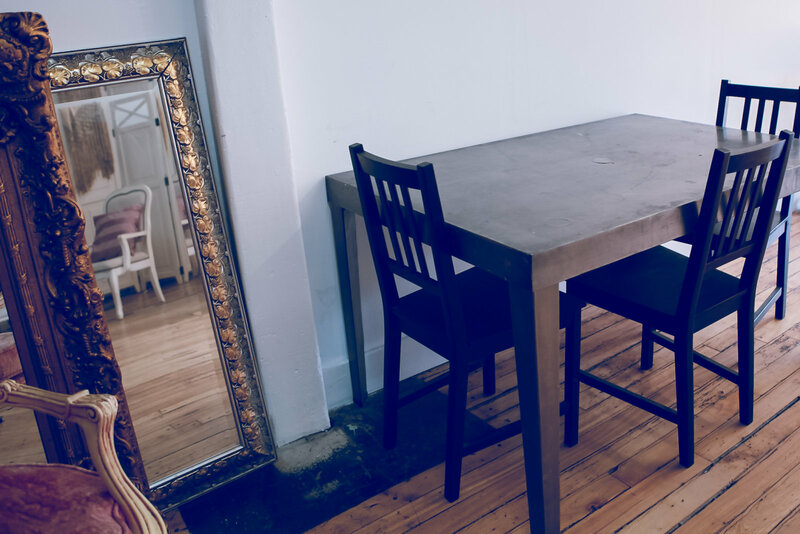 For those renters with shoots that would require a separate space— we do have an additional 1350 square foot space available. This is ideal for those that require video village, prop builders or production to be in a separate space, our second space is available for use. Our Primary Business is in the Fashion Industry, so this space has 11 hair/makeup stations, two large white glass tables that can seat anywhere from 12-16 people based on positioning. A desk area idea for important meetings. Anything that a normal business would have available to get them through the day. Custom Hour/Day Intervals Available. If the amount of hours/days you need is between packages; take the hourly rate of the package with less time and multiply that by number of hours you want. If a date is listing as not available, please email me directly at alexa@theglamfairy.com so I can double check. If you have any issues or questions, please do not hesitate to email me. Also, if you booking a duration in excess of 24 hours, contact me directly for a custom invoice. Please note this is a new service we are offering and it has been met with an incredible demand. We are doing our best to automate and integrate this process so you can quickly and easily book your time online. 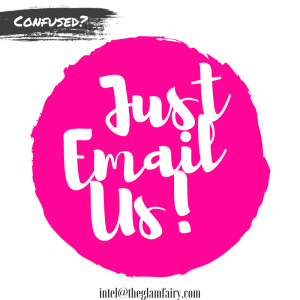 If you experience any confusion or glitches in the form, just email us and we will get your squared away. To book your date and time, please fill out the form below slowly and carefully. Book Your Studio Time Now! You have a beautiful studio space. I am a pet photographer and I was wondering if you allow dogs on the premises. If so, I would love to rent the studio for half a day for a calendar shoot. I can be reached at 973-441-6951. I look forward to hearing from you. I am interested in renting one of your studios for a two day workshop. Date would February 4th and 5th of 2017. There would be around 18 persons total (including instructor). 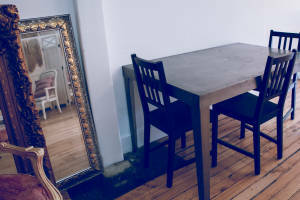 Big table to work (80 cm by 200cm – 32 by 79 inches approx. Also, each person would have a laptop; so I need electrical outlets; chairs and tables. Would it be possible to send me an estimate with all this? Thanks in advance for your response! I could come and see the studio if possible. Hi there, I apologize for the delay, I had no idea that people were contacting me directly on the blog. You will see that I added a form above where you can secure your time slot. If you have any trouble booking, please email me at alexa@theglamfairy.com and I will manually put your booking through. Two separate artists but both need photo shoots. 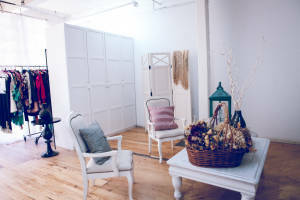 I would love to inquire about booking your Hoboken studio space. We intend to use the space for a photo-shoot for my handmade jewelry company LaMens. We are preparing to launch our website and in terms will be photographing our LaMens Choker Collection 2016 to kick things off. Our requesting booking date will be Sunday, September 11, 2016. We would like to book a full day and lock in the location as soon as possible. In addition, after reading about your services and MUA academy, we would also like to inquire about possible students that may be interested in building their portfolio and would potentially be willing to collaborate the day of the shoot. If so, please do let us know, we are open to negotiating any additional terms. Well, we look forward to your response and potentially booking your location. Thank you for your time and consideration. Learn about how the program works, read our course syllabus, view student portfolio images, and much more! Women bled themselves in the 1400’s for a "paler" look? 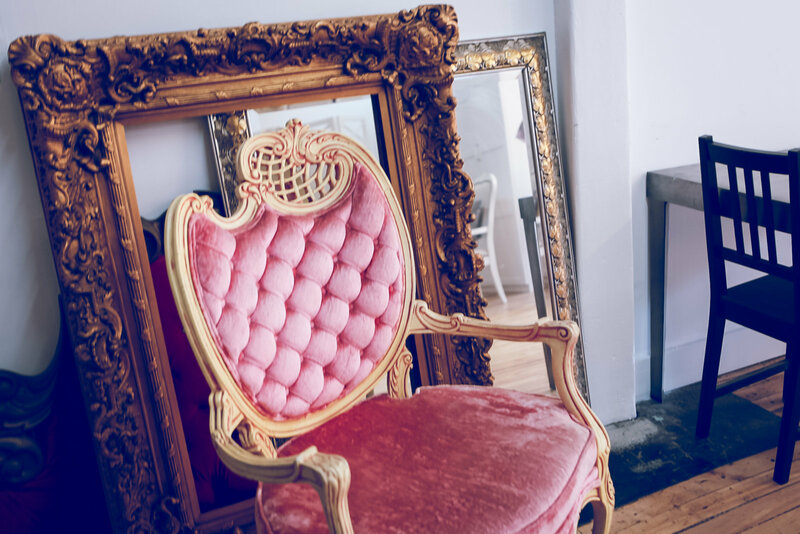 | My journey into becoming a makeup artist, working with World wide known Alexa Prisco in her Glam academy a little bit of Fashion, Hair and my life!! Working my way to the top! Feb. 21 GlamMe Workshop! The art of "Mastering My Makeup"
Women bled themselves in the 1400's for a "paler" look?